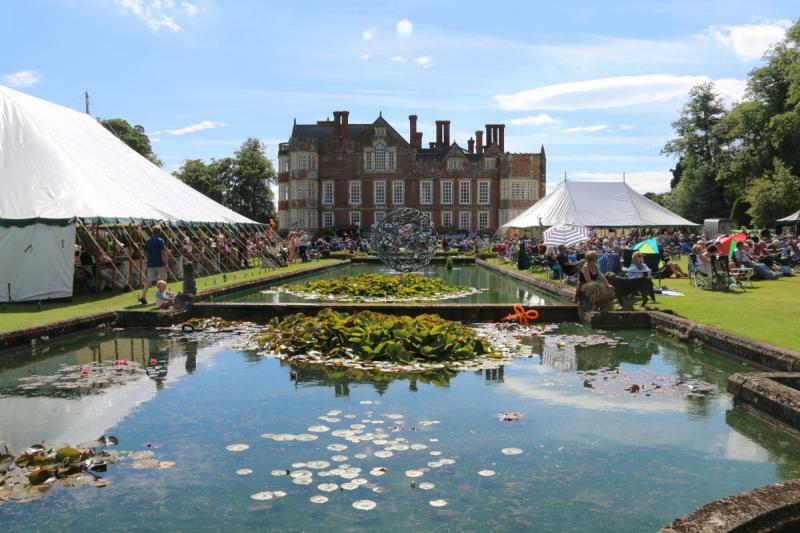 Headliners have been announced along with more of the wonderful acts that will perform at this years Burton Agnes Jazz and Blues Festival held in the stunning Great Hall, gardens and courtyards of the 16th century Elizabethan stately home that is Burton Agnes Hall, East Yorkshire. A truly, family friendly festival for all, including canine family members, festival goers will be treated to some fabulous Afro Beat and Punk Jazz courtesy of Newcastle and Cumbria band PONYLAND, music from one of the greatest keyboard players and multi-instrumentalists of his generation, Morris “Mo” Pleasure, melodic jazz from the vibrant quartet Emma Johnson’s Gravy Boat, along with country blues and ragtime, hokum, jug band Max and Veronica. Once again bringing the festival to a close will be Ben Beattie’s after midnight band plus host Simon Cunliffe-Lister. They join the already announced artists Artephis, The Mark Williams Trio and King For a Day: The Nat King Cole Story with Atila. An exciting collaboration of talented northern jazz artists, creating and performing original large scale jazz compositions. The group bring together their wide musical influences, including middle eastern harmonies; high energy, dance-able afro-jazz; and heavy metal and rock grooves. Powerful sounds from a strong brass section of saxophones, trombones and trumpets. Saddle up with PONYLAND for a ride into a heady, energetic world of live Afro-beat, Punk Jazz, with a 7-piece ensemble. Expect animalistic behaviour, galloping grooves that will make your legs rattle uncontrollably, chaos and raw energy! PONYLANDs line-up includes Frankie O’keeffe vocals, Jordie Cooke Guitar, Faye McCalman Saxaphone, Geoff Bartholomew Trumpet, John Pope Bass, Adam Stapleford Drums and Dave Mckeague Drums, creating a hypnotic interplay, entrancing the audience into fits of loose-limbedness. The band sonically aims to be the love child of Sun Ra and Lightning Bolt. Think African polyrhythms, syncopated beats, improvisation with punk scuzz. “Our music explores the themes of community, the loss of cultures and changing society and our live performance aims to break down the proverbial fourth wall between us and the audience”. PONYLAND brings together professional musicians from across Newcastle and Cumbria to create a sound that’s unique. Two Drummers, Vocals, lead and bass guitar and a mighty horn section. Something tribalistic this way comes! Highlights so far have been, supporting Shabaka Hutchings (The Comet is Coming) in the Cluny Newcastle, playing alongside the Mancunian Analog Alien Paddy Steer and headlining the Carvetti stage at Kendal Calling. Mark Williams is a guitarist/composer from Belfast who moved to Newcastle-Upon-Tyne to complete a BMus (hons) in Jazz, Popular and Commercial music. Since then he has played and recorded alongside some of the top musicians in the country. He formed his own trio back in 2009 to showcase his own compositional and improvisational talents. The trio draws influences from jazz, blues, rock, fusion and metal to create original music that is unique, diverse and honest. “….Williams’ playing is outstanding……..”. – The Jazz Mann. Celebrating the centenary of the birth of one of the greatest vocalists and entertainers of the twentieth century: Nat King Cole. Acclaimed vocalist, Atila, and a world-class group of musicians, have performed sell out shows at London’s Hippodrome and Ronnie Scott’s. They take a fresh look at the life and work of the timeless Nat King Cole, whose vocal styling in songs such as Nature Boy, Unforgettable, and When I Fall In Love defined a golden era of music and earned him a place in the history of American Music as one of the most iconic vocalists of all time. Expect Nat King Cole’s most celebrated songs, alongside stylish reworkings of his lesser-known gems. This is a unique evening celebrating one of music’s all-time greats. One of the greatest keyboard players and multi-instrumentalists of his generation. Morris “Mo” Pleasure has been at the forefront of American popular music for the last thirty years. A child prodigy, he began on piano at the age of four and by his early teens was also performing on bass, trumpet, guitar, drums and violin! After gaining a BA in Music in the mid 80’s, Mo began his professional career playing with Ray Charles before moving into the studios, including work with the likes of George Duke, Natalie Cole, Dianne Reeves, Christina Aguilera, Michael McDonald, Chaka Khan, and Roberta Flack. In 1993, he became a member of the legendary group Earth, Wind & Fire. ascending to become the band’s musical director from 1994-2001. He was featured with Janet Jackson, played keyboards and trumpet with Boney James and is currently musical director for the iconic Bette Midler. Mo was also approached by Michael Jackson to play keyboards in Jackson’s last touring band that was scheduled to perform in the late superstar’s historic 2009 comeback tour at London’s O2 Arena, which sadly never came to fruition. If all that wasn’t enough he is also a renowned composer and producer. Expect a selection of originals as well as Mo’s favourite classic funk, soul and groove songs. Mo will be joined by a hand picked band of some of the finest musicians in the UK, plus the vocal talents of Ivy Chanel. Philly native soul singer/songwriter, part African American, French and Native American, Ivy Chanel (younger sister of hall of fame inductee DJ Cash Money) has performed for Presidents and other dignitaries around the world. Ivy has worked with award winning artists and producers; Q-tip, Scratch Professor, Biz Markie, MBE Omar Lye-Fook, The Temper Trap, Curtis Richardson, Freedom C+C Music Factory, and DJ Kazu to name a few. Ivy is also a sought after vocal coach described by Simon Cowell as ‘Fantastic’, she has tutored a few of his artists such as Otsie Williams (JLS). Ivy has also worked with Anthony Duncan (Flawless), contestants from Missy Elliot’s ‘Road to Stardom’ and The Voice. Manchester-based contemporary jazz-rock quintet, Artephis, comprises some of the North’s most creatively diverse young musicians, who met at the Royal Northern College of Music. Their debut, loosely conceptual album, ‘ALL CHANGE NO CHANGE’, was independently released in June 2017 with an accompanying UK tour and has aired on BBC Radio 3’s ‘Jazz Now’ and BBC Radio 2, Jamie Cullum calling it a “brilliant new release that got my ears bouncing” and choosing ‘Feroz’ as his BBC Introducing highlight of the year. Formed in 2014, Artephis is a mercurial, improvising collective that draws contemporary influence from Christian Scott’s ‘Stretch Music’, Butcher Brown, and Brian Blade & the Fellowship, all the while rooted in Miles Davis’ late-’60s/early-’70s On The Corner/Big Fun/Jack Johnson era, distilling an eclectic sound of their own with an increasingly electronic element. Informed diversely by the musicians’ backgrounds and specialisms including Afrobeat, contemporary classical, funk and hip-hop settings, Artephis compose with a feel for the programmatic, immersing the listener in a familiar, while challenging, sound-space of imaginative textures, explosive and sensitive grooves, and spirited melodies. Described by mentor Mike Walker (The Impossible Gentlemen) as having ‘an organic, collectively individual sound that always has an eye on the narrative’, Artephis have performed at the Brecon, Manchester, Liverpool, Scarborough, Marsden and Lancaster Jazz Festivals, as well as at The Cavern Club, Band On The Wall, Kendal Calling, La Belle Angele and RNCM Opera Theatre. They are a Jazz North Northern Line artist 2018-19, and former Jazz North Introduces artist (2015-16). Emma Johnson’s Gravy Boat is a vibrant quartet, led by saxophonist and composer Emma Johnson and featuring Calvin Travers (g), Angus Milne (db), and Alasdair Wells (dr). Emma’s writing displays a contemporary sound rooted by infectious melodies and the group have been described as demonstrating a “strong and joyful bond, immediately apparent in their sound”. Gravy Boat is a band that aspires to write and perform melodic, accessible jazz that anyone can enjoy. Having been selected by Jazz North as one of this years Northern Line acts, Emma Johnson’s Gravy Boat are currently sailing around the UK performing at many prominent festivals before setting to work on their debut album. Veronica Sbergia and Max De Bernardi passionately play country blues and ragtime, hokum, jug band and rural music from the 1920’s and 30’s. They like to keep this precious musical heritage alive, faithfully reproducing its original sound whilst playing it with a modern twist. Together they represent an irresistible blend of blues, ragtime, vaudeville music and jug band music played using strictly acoustic instruments such as ukuleles, washboard, kazoo, acoustic and resophonic guitars. Max and Veronica won the European Blues Challenge 2013, held in Toulouse, France. They were selected in January 2015, for the International Blues Challenge in Memphis, Tennessee. Saxophonist and pianist Ben Beattie’s compositions bring together an intriguing mix of atmospheric jazz, blue grooves and soulful ballads. Festival organiser and saxophonist Simon Cunliffe-Lister joins Ben to play out the weekend. More artists will be added over the coming weeks. Friday and Saturday late night sessions acts to be announced soon. The Burton Agnes Jazz & Blues Festival began in 2007 and past performers have included the multi award winning Claire Martin OBE and Ray Gelato, Mississippi native Lisa Mills, Belfast Blues legend Kaz Hawkins, 3 time Grammy nominee Billy Branch, Jo Harrop and the New York Brass Band, to name but a few. Built in 1598 by Queen Elizabeth’s master mason, twenty-three generations of the same family have lived in this much-loved home, and filled the house with treasures. Today, magnificent original carvings provide a backdrop for fabulous French Impressionist paintings, contemporary furniture, tapestries and other contemporary artwork. Simon Jenkins, author of ‘England’s Thousand Best Houses’, described Burton Agnes Hall as ‘the perfect English house’ and as one of England’s twenty finest homes alongside Windsor Castle, Buckingham Palace and Chatsworth House.